Eye On Sports Media: What Are The Words To The National Anthem Again? What Are The Words To The National Anthem Again? Athens, GA (Feb 27, 2008) - Last Sunday, there was a painful moment at the Auburn-Georgia Women's Basketball game. The singer of the national anthem forgot the words and had to start over. Unfortunately, Eye on Sports Media did not have a camera at the game to capture that moment. Now who would have thought lightning would strike twice in the same week? Well it did. Luckily the camera was close at hand for tonight at the Florida-Georgia men's game as a totally different singer also forgot the words and had to start over also. 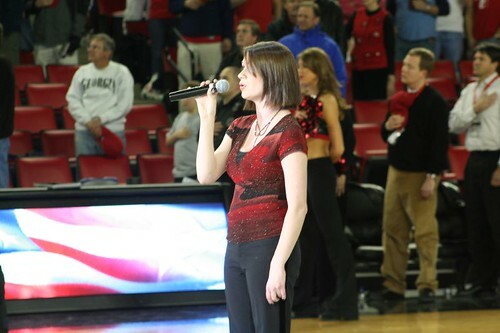 For the second UGA basketball game in a row, the singer of the national anthem forgot the words and had to start over. As Tim Hix, the Georgia Associate Director of Sports Communications, just whispered in my ear, she did recover quite nicely and nailed it in the rerun. Thankfully, the much then less than sold-out crowd was more forgiving then Simon Cowell would have been and gave her a rousing round of applause. As they say in the South: Bless her heart.